Mustangs to host Addison Trail on Monday! 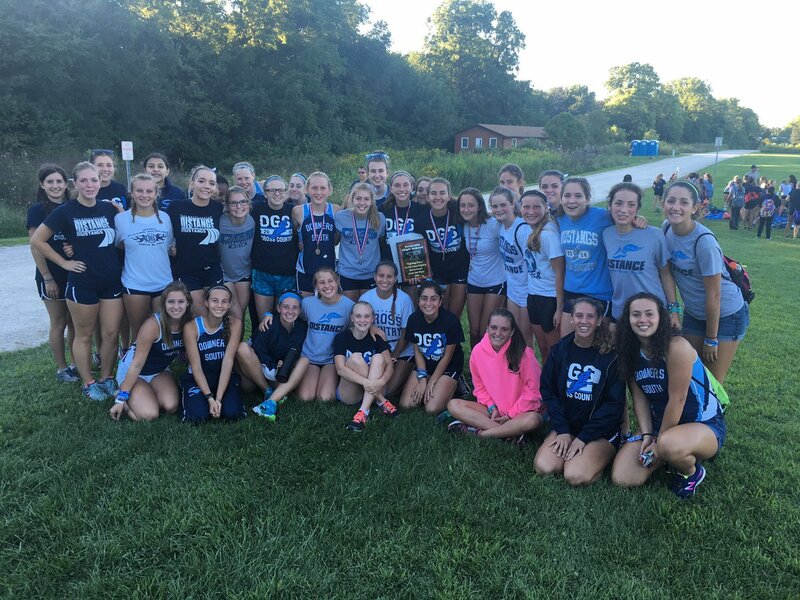 The girls team has currently won 102 consecutive conference dual meets and 17 straight conference titles (1999-2015). 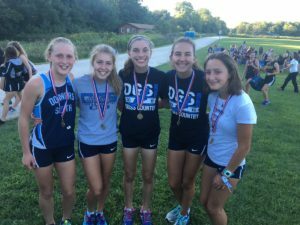 Author Coach PlunkettPosted on August 28, 2016 Categories Cross CountryLeave a comment on Mustangs to host Addison Trail on Monday! On Saturday, August 20, 33 members of the DGS girls cross country team volunteered their services at the inaugural Love>Fear 5K race in Westmont. The event was a fundraiser for the Reclaim13 organization that works to both prevent and help victims of sexual exploitation. 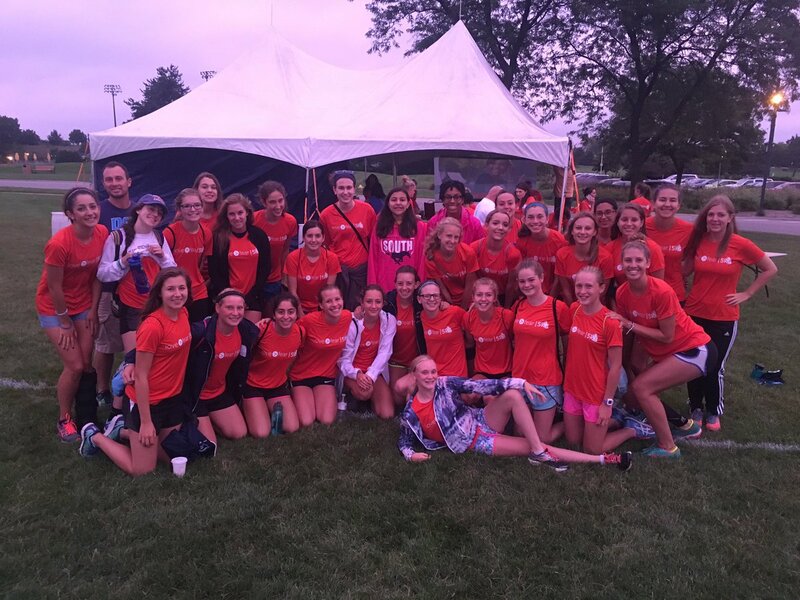 The Mustangs opened up the 2016 season by competing in the Yorkville Invite yesterday evening. The host Yorkville Foxes scored 22 pts to outdistance the 2nd place Mustangs with 53 pts. Chicago Northside Prep and Oswego East were the next closest teams with 82 and 101 pts respectively. Yorkville is currently ranked #2 in the state of Illinois. Katie Stapleton (Sr) led the Mustangs with her 3rd place finish out of 169 runners in 18:32 over the 3 mile course. Becky Versaskas (So) was close behind in 8th place (18:51). Melissa Weidner (So) and Brenna Cohoon (Fr) finished in 11th and 12th places (19:20 and 19:22). Kennedy Warden (Fr) rounded out the DGS scoring by placing 19th in 20:18. Individual DGS results and splits can be found on the Schedule/Results page. Full meet results can be found at the Kompusport website. DyeStatIL covered the meet and posted both a meet highlight video and a video interview of Katie Stapleton. Both videos can be found on the Pictures/Video page. Author Coach PlunkettPosted on August 23, 2016 August 23, 2016 Categories Cross CountryLeave a comment on Yorkville Invite Results! Mustangs to open CC season at Yorkville! The DGS Girls Cross Country team will open up the 2016 season at the Yorkville Invite on Monday. The Mustangs will travel to the Hoover Outdoor Ed Center to take on 6 or 7 other teams including the 5-time defending 2A state champion Yorkville team. There will be one boys race at 4:45pm and one girls race at 5:30pm. The bus will leave DGS at 2:30pm. See the Schedule/Results page for driving directions and a course map. Author Coach PlunkettPosted on August 21, 2016 Categories Cross CountryLeave a comment on Mustangs to open CC season at Yorkville! On Friday, we will have practice at 7:00am, and then we will meet at 10:00am at the stadium for pictures. Please bring your picture order form if you are going to order any team or individual pictures. I will open up the locker room for anyone that needs to use it before our picture time. On Saturday, we will be meeting in the parking lot located at the Southeast Corner of Ty Warner Park Overflow Parking Lot in Westmont at 5:30am. The team will be volunteering for the inaugural Love>Fear 5K Run/Walk event. This race is a fundraiser for the Reclaim 13 organization which is devoted to ending the cycle of abuse and sexual exploitation of children. We will be working from 5:30-10:30am that day. On Monday, we will have varsity practice at 7:00am. Later, everyone should be at DGS by 2:15. Our bus to Yorkville will leave at 2:30pm. There will be one girls race at 5:30pm. You can access a course map on our schedule/results page on our team website. Seniors, you have until this Saturday to reserve a pasta party date (first come, first serve). As of right now, there are only 5 open dates left. Take advantage of the practice calendar on our team website to plan ahead. Those of you who ordered spirit wear, it should come in sometime in the next week or two. After the 1st week of school, we will open up the spirit wear order site to allow for more orders. The captains will also have team shirts for people to order if you want. Author Coach PlunkettPosted on August 18, 2016 Categories Cross CountryLeave a comment on Team Reminders!